You survived the twin pregnancy and have brought the twins home. Now the real adventure begins. 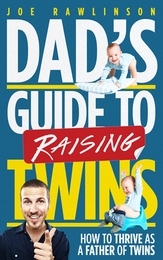 This guide will walk you though the challenging and exciting aspects of raising twins. You can thrive as a father of twins even during the crazy early years. 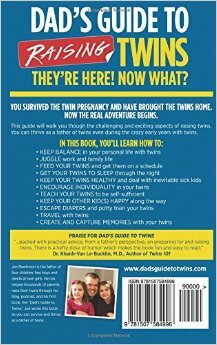 Joe's first book for fathers of twins, the "Dad's Guide to Twins," got you ready for your twins' arrival. This companion book continues the journey and helps you from the moment you get the twins home. It guides you through what to expect and how to handle those precious twins through the first couple of years. Joe's latest book, the "Dad's Guide to Raising Twins" walks you through the early years of parenting twins. In it, you'll learn how to get your twins in a good sleep routine, feed them, potty train, and successfully make it through the challenging first years with twins. If you are expecting twins, have newborns, or are struggling through that first year (or more) with twins, this book is for you. You'll find tips and tricks to tackle each stage of your twins' development plus ideas to improve what you're already doing. Joe Rawlinson is the father of four children: two boys and identical twin girls. He has helped thousands of parents prepare for twins through his Dad's Guide to Twins blog, podcast, and books.